"Loudoun County" redirects here. For the county in Tennessee, see Loudon County, Tennessee. Loudoun County (/ˈlaʊdən/) is a county in the Commonwealth of Virginia in the United States. In 2017, the population was estimated at 398,080, making it Virginia's third-most populous county. Loudoun County's seat is Leesburg. Loudoun County is part of the Washington–Arlington–Alexandria, DC–VA–MD–WV Metropolitan Statistical Area. As of 2015[update], Loudoun County had a median household income of $125,900. Since 2008, the county has been ranked first in the U.S. in median household income among jurisdictions with a population of 65,000 or more. Loudoun County was established in 1757 from Fairfax County. The county is named for John Campbell, Fourth Earl of Loudoun and Governor General of Virginia from 1756–59. Western settlement began in the 1720s and 1730s with Quakers, Scots-Irish, Germans and others moving south from Pennsylvania and Maryland and by English and African slaves moving upriver from Tidewater. By the time of the American Revolution, it was Virginia's most populous county. It was also rich in agriculture, and the county's contributions of grain to George Washington's Continental Army earned it the nickname "Breadbasket of the Revolution." During the War of 1812, important Federal documents and government archives were evacuated from Washington and stored at Leesburg. 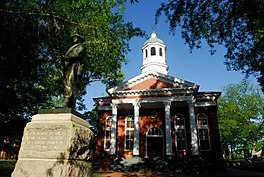 Local tradition holds that these documents were stored at Rokeby House, making Leesburg briefly the capital of the United States. U.S. President James Monroe treated Oak Hill Plantation as a primary residence from 1823 until his death on July 4, 1831. The Loudoun County coat of arms and flag, granted by the English College of Arms, memorialize the special relationship between Britain and the United States that developed through his Monroe Doctrine. During World War I, Loudoun Country was a major Breadbasket for supplying provisions to soldiers in Europe. Loudoun farmers implemented new agricultural innovations such as vaccination of livestock, seed inoculations and ensilage. The county experienced a boom in agricultural output, outputting an annual wheat output of 1,040,000 bushels in 1917, the largest of any county in Virginia that year. 1,200,000 units of home produce were produced at home, much of which went to training sites across the state such as Camp Lee. The Smith–Lever Act of 1914 established increased agricultural education in Virginia counties, increasing agricultural yields. After the war, a plaque was dedicated to the "30 glorious dead" from the county who died in the Great War. Five of the thirty died on the front, while the other twenty five died while in training or in other locations inside the United States. In 1962, Washington Dulles International Airport was built in southeastern Loudoun County in Sterling. Since then, Loudoun County has experienced a high-tech boom and rapid growth. Accordingly, many have moved to eastern Loudoun and become residents of planned communities such as Sterling Park, Sugarland Run, Cascades, and Ashburn Farm, making that section a veritable part of the Washington suburbs. Others have moved to the county seat or to the small towns and rural communities of the Loudoun Valley. The scenic byways of Loudoun County are spotted with historical structures predating the American Civil War. The county's official motto, I Byde My Time, is borrowed from the coat of arms of the Earl of Loudoun. In the late 20th century, as northerners gradually migrated to Southern suburbs, Loudoun County increasingly shifted to the Republican Party in supporting presidential candidates, and more local ones. But that may be changing with changing demographics. Before the 2008 election of Barack Obama, county voters had not supported a Democrat for President since Lyndon B. Johnson in 1964. In recent years, the county's rapid growth in its eastern portion, settled by educated professionals working in or near Washington, D.C., has changed the demographics, and the Democratic Party has become increasingly competitive in the county. After giving Senator Barack Obama nearly 54% of its presidential vote in 2008, the county supported Republican Bob McDonnell in 2009, who received 61% of the gubernatorial vote. Voters also replaced two incumbent Democratic delegates, making Loudoun's state House delegation all-Republican. In 2012 county voters again supported Obama, who took 51.5% of the vote, with Republican challenger Mitt Romney garnering 47%. Democrats carried the county again in the 2016 presidential election, when Loudoun swung heavily towards Hillary Clinton, giving her 55.1% to Trump's 38.2%. Like many counties in Virginia, Loudoun is locally governed by a board of supervisors, the Loudoun County Board of Supervisors. The Chairman of the Board is elected by county voters at-large while the remaining supervisors are elected from eight single-member districts roughly equal in population. All nine members serve concurrent terms of four years. The board handles policy issues and sets the budget; it appoints a County Administrator to handle the county government's day-to-day operations. As of the 2015[update] elections, the Chairman of the Board and two district supervisors are Democrats; the remaining six supervisors are Republican. The 2003 board, and other officials in Loudoun, was the subject of a federal investigation of possible corruption relating to a land deal involving the Royal Saudi Academy. In November 2007, voters removed four incumbent, fiscally conservative Republicans from the Board of Supervisors in a backlash over rapid development in the county's eastern portion. The Board's make-up after the election was five Democrats, two Republicans, and two Independents. In November 2011, Republicans were elected to all nine seats on the Board. In 2015 three were replaced by Democrats. On September 6, 2015, Broad Run Supervisor Shawn M. Williams resigned after his arrest for assault. In November 2017, voters replaced three of the four Republican state Delegates with Democrats, leaving only a sole Republican Delegate representing the county in Richmond. According to the U.S. Census Bureau, Loudoun County has a total area of 521 square miles (1,350 km2), of which 516 square miles (1,340 km2) is land and 6 square miles (16 km2) (1.1%) is water. It is bounded on the north by the Potomac River; across the river are Frederick, Washington and Montgomery counties in Maryland; it is bounded on the south by Prince William and Fauquier counties, on the west by watershed of the Blue Ridge Mountain across which are Jefferson County, West Virginia and Clarke County, and on the east by Fairfax County. The Bull Run Mountains and Catoctin Mountain bisect the county. To the west of the range is the Loudoun Valley. Bisecting the Loudoun Valley from Hillsboro to the Potomac River is Short Hill Mountain. Block numbers in the unincorporated areas of Loudoun County, with the exception of older Sterling Park and the community of CountrySide, are assigned in the following manner: on north-south streets, block numbers increase from north to south and range from 10000 to 27000; on east-west streets, block numbers increase from west to east and range from 30000 to 48000. Traditionally a rural county, Loudoun's population has grown dramatically since the 1980s. Having undergone heavy suburbanization since 1990, Loudoun has a full-fledged service economy. It is home to world headquarters for several Internet-related and high tech companies, including Verizon Business, Telos Corporation, Orbital Sciences Corporation, and Paxfire. Like Fairfax County's Dulles Corridor, Loudoun County has economically benefited from the existence of Washington Dulles International Airport, the majority of which is in the county along its border with Fairfax. Loudoun County retains a strong rural economy. The equine industry has an estimated revenue of $78 million. It is home to the Morven Park International Equestrian Center which hosts national horse trials. In addition, a growing wine industry has produced several internationally recognized wines. Loudoun now has 40 wineries and over 25 active farms. Loudoun has rich soil and was in the mid-19th century a top wheat-producing county in the fourth largest wheat-producing state. MCI, Inc. (formerly WorldCom), a subsidiary of Verizon Communications, is headquartered in Ashburn, Loudoun County. It announced it would move its headquarters to Ashburn in 2003. AOL had its headquarters at 22000 AOL Way in Dulles in unincorporated Loudoun County. In 2007 AOL announced it would move its headquarters from Loudoun County to New York City; it would continue to operate its Virginia offices. Orbital Sciences Corporation has its headquarters in Dulles. Loudon County houses over 60 massive data centers, with many housing the cloud operations of Amazon Web Services (AWS). These data centers are estimated to carry 70 percent of global web traffic. Before its dissolution, Independence Air (originally Atlantic Coast Airlines) was headquartered in Dulles. At one time Atlantic Coast Airlines had its headquarters in Sterling. Before its dissolution, MAXjet Airways was headquartered on the grounds of Washington-Dulles International Airport. From 1890 to 1940, the county had a decline in population as people moved to cities for more opportunities. The decline was likely highest among African Americans, who had worked in an agricultural economy that was becoming increasingly mechanized. During the first half of the 20th century, African Americans moved out of rural areas to cities in the Great Migration. In the early 21st century, they are a small minority within the county. According to the 2010 census, 10.5% of residents reported being of German ancestry, while 9.1% reported Irish, 7.7% English, 5.4% Italian and 5.2% American ancestry. In the county, the population was spread out with 29.80% under the age of 18, 5.70% from 18 to 24, 38.90% from 25 to 44, 20.00% from 45 to 64, and 5.60% who were 65 years of age or older. The median age was 34 years. For every 100 females, there were 97.80 males. For every 100 females age 18 and over, there were 95.50 males. In 2011, Census survey data concluded that Loudoun County had the highest median income in the country at $119,134. From 1980 to 2014, deaths from cancer in Loudoun County decreased by 46 percent, the largest such decrease of any county in the United States. From 2017 to 2018, Loudoun County saw an increase of 18.5% of households experiencing homelessness, a 21% increase for single adults, and a 36% increase for families. Homelessness for veterans in the county decreased by 16% from 2017 to 2018. The National Transportation Safety Board operates the Ashburn Aviation Field Office in Ashburn, an unincorporated area of Loudoun County. Emergency services are provided by the Loudoun County Fire and Rescue Department with the Office of Emergency Management. LCFR is a combination system that utilizes some 1,500 volunteers and 500 firefighters, EMT/paramedics, and support staff. LCFR is one of the largest fire and rescue systems in Virginia. Law enforcement in Loudoun County is served by the Loudoun County Sheriff's Office, as well as three town police departments: Leesburg Police, Purcellville Police, and Middleburg Police. The Loudoun County Public Library System has eleven branches in the county. The library's Outreach Department of the Loudoun County Public Library is a resource for those who cannot easily access branch services. The public library system has won many awards, and came in 10th place for libraries serving a comparably sized population in 2006 Hennen's American Public Library Ratings (HAPLR). Loudoun County has two airports: the Washington Dulles International and Leesburg Executive. Loudoun County operates its own bus public transit system, known as Loudoun County Commuter Bus. The Silver Line of the Washington Metro, will extend into Loudoun County. The planned extension will include stations at the Dulles International Airport, and two stations in Ashburn, Virginia. The county is served by Loudoun County Public Schools (LCPS). LCPS serves over 70,000 students from Kindergarten through 12th grade and is Virginia's fifth largest school system. While there is a trend toward home schooling in the county, the vast majority of school age children attend LCPS schools. Loudoun County schools recently ranked 11th in the United States in terms of educational achievement versus funds spent. Loudoun County also sends students to its Loudoun Academy of Science, housed within Dominion High School, and is eligible to send students to Thomas Jefferson High School for Science and Technology, a STEM magnet school in Alexandria, Virginia. Loudoun County is home to ten private schools: Loudoun Country Day School, a Pre-K–8 independent school in Leesburg; Notre Dame Academy, an independent non-denominational day high school in Middleburg; the Foxcroft School, a boarding school for girls located in Middleburg; Dominion Academy, a Non-denominational Christian school, K–8 in Leesburg; Loudoun Classical School, a Protestant classical 7th-12th grade school in Purcellville; Leesburg Christian School, a K–12 school in Leesburg; St. Theresa School, a K–8 Roman Catholic school in Ashburn; Village Montessori School at Bluemont, an accredited Pre-K through Elementary Montessori school in Bluemont; Christian Faith & Fellowship School, a PreK–12 non-denominational Christian school and Loudoun County's only private school accredited by the Association of Christian Schools International; and Ideal Schools High School, an independent non-denominational school in Ashburn. In terms of post-secondary education, Loudoun County is home to a variety of colleges and universities, including: Patrick Henry College; a branch of Northern Virginia Community College in Sterling; George Washington University (satellite campus); George Mason University (satellite campus); Marymount University (satellite campus); Shenandoah University (satellite campus); and Strayer University (satellite campus). Loudoun is also home to a satellite campus of the Virginia–Maryland College of Veterinary Medicine and the Janelia Farm Research Campus of the Howard Hughes Medical Institute. James Monroe constructed and resided at Oak Hill near Aldie after his presidency. American Civil War Brigadier General Robert H. Chilton (Chief of Staff under Robert E. Lee) was a native of Loudoun County. World War II general George C. Marshall resided at Dodona Manor in Leesburg. Essayist and journalist Russell Baker grew up in Morrisonville, Virginia and his book Growing Up highlights his childhood in rural Virginia. Entertainer Arthur Godfrey lived near historic Waterford, Virginia. Loudoun County is also the birthplace of Julia Neale Jackson, mother of Stonewall Jackson, and Susan Catherine Koerner, mother of the Wright Brothers. John Champe – Revolutionary War soldier and double agent. George Marshall (1880–1959) – General of the Army (5-star), U.S. Secretary of State and author of the "Marshall Plan"
Sheila Johnson (1949–) – Entertainment and sports entrepreneur and philanthropist. Paul Pastorek (1954–) – former Louisiana state superintendent of education; now general counsel to Airbus Group, Inc.
^ a b Rosalind S. Helderman, Proud Past, Bright Future Rub Elbows in Today's Loudoun, Washington Post (April 21, 2005), page LZ03. ^ a b "About Loudoun - History". Loudoun County. Retrieved January 3, 2013. ^ a b "LOUDOUN COUNTY INCOME HIGHLIGHTS, AMERICAN COMMUNITY SURVEY, 2011 ACS UPDATE". Loudoun County Department of Planning. Retrieved March 26, 2014. ^ a b "Loudoun History". Loudoun_Museum. Archived from the original on March 24, 2014. Retrieved March 22, 2014. ^ An Account of James Monroe's Land Holdings, by Christopher Fennell. Chapter V. Oak Hill Plantation, Loudoun County. Accessed November 18, 2016. ^ Rainville, Lynn. Virginia and the Great War : mobilization, supply and combat, 1914-1919. Jefferson, North Carolina: McFarland & Company, inc., Publishers. p. 60. ISBN 978-1-4766-7192-5. ^ Coat of Arms, Loudoun County. ^ "Wayback Machine". November 11, 2012. Archived from the original on November 11, 2012. Retrieved August 7, 2018. ^ Leip, David. "Dave Leip's Atlas of U.S. Presidential Elections". Uselectionatlas.org. Retrieved August 7, 2018. ^ "Loudoun County Board of Supervisors Operations Manual". Loudoun.gov. Archived from the original on July 13, 2016. Retrieved August 7, 2018. ^ "UPDATED: Unofficial Loudoun 2015 election results, voter turnout". Loudountimes.com. Retrieved August 7, 2018. ^ Laris, Michael; Somashekhar, Sandhya (February 7, 2007). "Loudoun Land Deals Subject of U.S. Probe". The Washington Post. ^ Somashekhar, Sandhya (November 7, 2007). "Slow-Growth Board Candidates Win". The Washington Post. ^ Smith, Dusty (November 9, 2011). "Loudoun Goes Red, Big Time". Ashburn Patch. ^ "Loudoun County Supervisor Charged with Assault After Dispute". Washington Post. September 6, 2015. ^ "Loudoun Domestic Tourism Worth Nearly $1.7 Billion - Loudoun County Economic Development, VA". Loudoun County Economic Development, VA. September 13, 2017. Retrieved June 4, 2018. ^ "Another Record Year at Dulles International Airport - Loudoun County Economic Development, VA". Loudoun County Economic Development, VA. February 26, 2018. Retrieved June 4, 2018. ^ "Loudon Is DC's Wine Country". Loudoun Convention and Visitors Association (Visit Loudoun). Archived from the original on May 29, 2013. ^ "Early 19th-Century Milling and Wheat Farming". The History of Loudoun County, Virginia. Since its settlement in the mid-1700s, Loudoun County has been acclaimed for its fertile soil. In the 1850s and 1860s, Virginia was the fourth largest wheat producing state, and Loudoun was one of the state's top-producing counties. ^ MCI Inc (March 14, 2003). "Schedule 13D. Amendment to General Statement of Beneficial Ownership". Securities and Exchange Commission. Retrieved September 25, 2009. ^ Reuters news agency (April 14, 2003). "WorldCom to emerge from collapse". CNN (international ed.). Retrieved September 25, 2009. ^ "Company Overview". AOL. February 8, 2008. Archived from the original on February 18, 2009. Retrieved May 7, 2009. ^ Goldfarb, Zachary; Diaz, Sam (September 18, 2007). "AOL Moving Executives, Headquarters to New York". The Washington Post. p. A01. Retrieved May 7, 2009. ^ "Contact Information". Orbital Sciences Corporation. Retrieved September 25, 2009. ^ "Amazon Plans Epic Data Center Expansion in Northern Virginia". Data Center Frontier. November 6, 2017. Retrieved February 14, 2019. ^ "70 Percent of the World's Web Traffic Flows Through Loudoun County | Washingtonian (DC)". Washingtonian. September 14, 2016. Retrieved February 14, 2019. ^ "Company Information". Atlantic Coast Airlines. August 11, 2001. Archived from the original on August 11, 2001. Retrieved September 25, 2009. ^ "Independence Air, Inc". Bloomberg Businessweek. Retrieved September 25, 2009. ^ "Contact Us". MAXjet Airways. February 18, 2007. Archived from the original on July 18, 2006. Retrieved September 25, 2009. ^ "Comprehensive Annual Fiscal Report" (PDF). County of Loudoun, Virginia. December 22, 2011. Archived from the original (PDF) on April 29, 2014. ^ Barry-Jester, Anna Maria. "How Americans Die May Depend On Where They Live". FiveThirtyEight. December 13, 2016. ^ Baratko, Trevor (May 25, 2018). "On the brink: Homelessness on the rise in Loudoun County". LoudounTimes.com. Retrieved May 25, 2018. ^ Library, Loudoun County Public. "Locations and Hours". Library.loudoun.gov. Retrieved June 4, 2018. ^ Settimi, Christina (July 5, 2007). "Best And Worst School Districts For The Buck". Forbes. Retrieved July 17, 2008. ^ "Loudoun County Academy of Science". Loudoun County Public Schools. Loudoun County Public Schools. Retrieved August 17, 2015. ^ "TJHSST Eligibility Requirements". Fairfax County Public Schools. Retrieved April 19, 2017. ^ "Loudoun Classical School". Retrieved April 1, 2019. ^ "Loudoun Guide 2006: Higher Education at Your Fingertips". The Washington Post. 2006. ^ "Stonewall Jackson Ancestors". VMI Archives. Virginia Military Institute. She was born 28 February 1798 near Aldie, Loudoun Co., VA.
^ "Happy Mother's Day, Mrs. Wright". AOPA ONLINE. Aircraft Owners and Pilots Association. Susan Catherine Koerner was born in tiny Hillsboro, Va.
^ "Biographical Sketch of John L. Dagg". founders.org. Archived from the original on November 4, 1996. ^ "William Wilson - Previous Illinois Supreme Court Justice". Illinoiscourts.gov. ^ "Stevens Thomson Mason Biography - Biography.com". Archive.is. September 30, 2007. Archived from the original on September 30, 2007. Retrieved August 7, 2018. ^ "The Pulitzer Prizes". pulitzer.org. Wikimedia Commons has media related to Loudoun County, Virginia. Wikivoyage has a travel guide for Loudoun County. This page was last edited on 11 April 2019, at 02:00 (UTC).